Coleus is a popular container plant for their colorful display. As they are shade loving plants, they can be brought indoors and placed near a sunny window. Can you grow new coleus plant from cuttings? The answer is yes, you can easily divide coleus from soft wood cuttings. 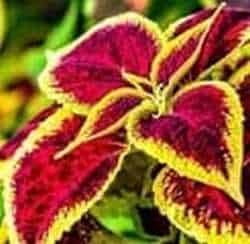 Follow the guide below on how to start coleus plant from cuttings. Coleus can be grown by cuttings or seeds. I have grown coleus from both the cuttings and seeds. The new plants propagated from the cuttings will be identical to the parent plant, but seeded plants may be different as in the case of other plants. You can propagate a coleus from early summer to late fall. In general, the propagation steps are similar to growing blueberries from cuttings, growing bougainvillea from cuttings, rooting rose cuttings, jasmine propagation and hydrangeas propagation. Take cuttings about 3-4 inches long from the non-flowering healthy tips of the plant in early Autumn. Make the cut just below a leaf node. Remove the bottom set of leaves and put in soil with at least one set of leaf nodes beneath the surface of the soil. The natural rooting hormones is recommended but is not absolutely necessary. Water and place in shade or in a plastic zip bag. New leaves will start to emerge within 3 weeks or even less. After you take the cutting of coleus as described above, fill a jar with water at room temperature and place the cuttings in it such that the bottom 2 inches of the stems are underwater. In about 2-3 weeks, coleus stem will produce roots. Remove the stem from the water and plant in a small pot filled with free draining potting mix. You may have noted that there is no need to put the cuttings in rooting hormone before putting the cuttings in soil if the cuttings have been taken from soft wood.